talk about until Habib returns. Jment Center, located 1700 N.W. | and drinking beer and wine. pressure was the "main problem"
directive in 1980, Maynard I.
for the good of all people. Seminary is now in its 97th year. added to a tax bill by the U.S.
tely 30 percent from a year ago. percent from the previous year. service and social service sectors. "Nobody is safe from this,"
workers in the skilled trades. and programs in their hour"
Federation la putting you on the Mm. N.E. Comer of Military Trail* W. Atlantic Ave.
Lin Beirut had become a "buffer"
The charge was made by Maj.
Iwas killed and 25 wounded. Carla C, World Renaissance & Daphne. heart ol the Caribbean, so you II see more portsup to a port a day. Antigua and St Thomas among others. M'Ot'ion OOuOWoccuPJnty Roonfl lup of*"
ACosta Cruise is easy to take. strike he began last Sept. 26.
he is in "satisfactory condition,"
Shekels for a family of four. Federation will convene on Monday Feb. 14. Sixteen additional will complete their existing terms. Road in Boca Raton. Hours. review said in its introduction. Lebanon and achieved the wak. House last year as "suustrsirw. wounded last June 3 outside s London hotel. over security arrangements. Just leave." government would feel free to normalize relations with I wad. goal is speedy Israeli withdrawal. arrangements the stage will be set for another Lebanon war. deed, is to substitute an oxymoron for a simple fact. County telephoning to help Jews in need everywhere. To reserve a phone call 368-2737. ANSWER THE CAJLL TO LIFE. chance to make fund-raising history. single dsy than ever before. Give us two hours of your time on Msrch 20. To call your friends and neighbors. Jewish life In this decade. Reserve your Super Sunday" telephone now. Please reserve a telephone tor me. concern to friends of Israel. The Gang of Four are Sens. |the Ford plans to "reasses" U.S.
jritt'li actions and supporting U.S. I not deserve based on his actions. *ercy and Sen. Howard Baker. 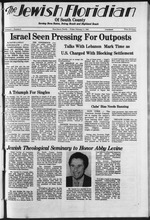 felms will run for in 1984.
criticizing Israeli actions and supporting US. Minimum gift). Call 368-2737, ask for Joyce. punish Israel by cutting U.S.
military assistance by 10 percent. innocent piece of toast Just terrible. at the door for $10. hold next meeting on Sunday. the meeting starting at 7:30 p.m.
with pickup the week of Feb. 20. Board Meeting on Monday, Feb.
14 at the home of Eva Kaufman. may bring a prospective member. from Temple Emeth at 8:45 a.m.
next meeting on Tuesday, Feb.
WELL HELP YOU FIND ONE! Speakers available for both Jewish and non-Jewish groups. the Hyatt Hotel of Palm Beach. by the "Atlantic Edition Group." For information call 499 2225.
and card party on Monday, Feb.
tion, call Ann Zwilling 498-5958.
lage West, Boca Raton. Mrs.
age. Refreshments will be served. expects you to settle for second choice". INVEST SOME OF YOU IN YOUR FUTURE!!! Former Dean of Students, Scarsdale, N. Y.
he can get the job done. -Palm Beach County, Friday, Feb.
1 in. luding three assistant rabbis. er book devised by Rabbi Zeldin. Grade to let us know your plans. their teaching and the program. religious works in her own right. Keynoters Luncheon Committee. Call 368-2737. ON THE OCEAN AT 43 ST. If you can't resist a bargain. Wolffs Kasha is for you. has been roasted to bring out Its nutty flavor. Wolff s 15< coupon | n.
It's made with Wolffs Kasha! fund-raising luncheon to be held on March 13.
open normal working hours, 9 am to 5 pm. all the way to seek peace. Monday, Feb. 14, in Algiers. forces from Lebanon by March 1.
transAuto and fly...than it is to drive! contact your local travel agent or the transAuto representative nearest you. crease of over 80 percent. '.Schiller, Sylvia Zuckerman, Eleanor Ooldblum, Bernice Left to right: Esther Blank, Lillian Kent, Bessie Marcus. U-ebbin. Muriel Harris. Phyllis Wragge. Julia Savin. Freddy Kraft sow. Sherry Endelson, Rita Bogus. Romanoff. Ross, Selma Axelrod, Manan Altman, Betty Lester. Rhea Labov, Louise Cohen, Rhea Moss. Dollsey Rappaport, Emy Kalmanoff. Polly Kaltenbacher. Yusem, Marilyn Sonabend, Sherry Endelson. iMuan Gettinger, Helen Gimbei, Libby Shipley. aunt and uncle, Dr. and Mrs.
aunts and uncles from New York. B'nai Torah Men's Club, 9:30a.m. meelina. p.m. Israel Bond Parlor meeting Chalfonte So. 7:30 p.m.
Emeth-Singles, 12:30 p.m. meeting Diamond Club, 9 a.m.
meeting Hadassah Association of South County, 9 a.m.
meeting Women's American ORT-AII Points, meeting. p.m. Board meeting Pioneer Women-Kinneret, 12:30 p.m.
Board meeting American Mizrachi Women Kfar, 10 a.m.
meeting Israel Bond Parlor meeting 730 p.m.
National Council of Jewish Women, 10 a.m. meeting. p.m. meeting Women's American ORT-North Pines, 12:30 p.m.
Jewish Women, 8 p.m. meeting. Community Relations Council meeting 12 noon. 9 a.m. meeting B'noi B'rith-Shomer lodge, 2 p.m. meeting. Pines of Delray North Breakfast, 9:30 a.m.
Coco Woods Breakfast, 9:30 a.m.
B'nai Torah Supper Honoring Saul Glueckman, 6 p. m.
|$500 minimum gift. Call 368-2737. 1401 N.W. 4th Ave., Boca Raton, Fla. 33432. Conservative. Thursday mornings at 8:15 a.m.
a.m. and 9 a.m. Saturday. Phone 499-9229. Kiddush. Edward Dorfman, President, 6707 Moonlit Drive. Mailing Address: P O. Box 134. Boca Raton. Fla. 33432. President, Joseph M. Pollack, Cantor. 483-6667. Box 1901 ftl oy BueaCn' FI R*0 MaUin Address: P.O. Samuel Silver. President Bernard Etish, 276-6161. Begin in Cairo, where there was still hope for the future. would be easier," he said. we are accepting new patients, no one need leel any obligation. (Phase II, behind J. Byrons) Open 24 Hr. sein's, to join the peace process. 4051 W. Atiaatk Art. **"?" trip to the Jewish State in 1949. * Counselors interested in working with"
children in a Jewish Day Camp setting. at 368-2737 for an application and interview. New 2 story Home east ol Federal appro. screened porch S96.000. Jerie Nltchman. 1M floor Condo at Boca Barwood. Features full sized washer & dryer in Unit. , Meed offers! Judy Walker, eves 272-2573. Bdrm/t v, Bath Ideal for single, retirees. when the hour of need arises.